ZURICH (AP) -- Soccer's rules-making approved headscarves for female Muslim players on Thursday, reversing a ban on the Islamic hijab that was enforced in FIFA competitions for five years. The panel, known as IFAB, gave its approval to the headscarves after FIFA's medical committee decided two scarf designs submitted to its experts do not threaten the safety of female players. The approved designs use quick-release velcro fasteners and magnets. Soccer prohibits equipment that is dangerous or makes religious statements. 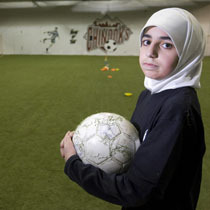 Headscarves have been banned on the soccer field since 2007.